The private lives of minerals: Understanding how and where minerals hook up helps predict location, promises to speed discovery rate. Applying big data analysis to mineralogy offers a way to predict minerals missing from those known to science, as well as where to find new deposits, according to a groundbreaking study. In a paper published by American Mineralogist, scientists report the first application to mineralogy of network theory (best known for analysis of e.g. the spread of disease, terrorist networks, or Facebook connections). The results, they say, pioneer a potential way to reveal mineral diversity and distribution worldwide, their evolution through deep time, new trends, and new deposits of valuable minerals such as gold or copper. 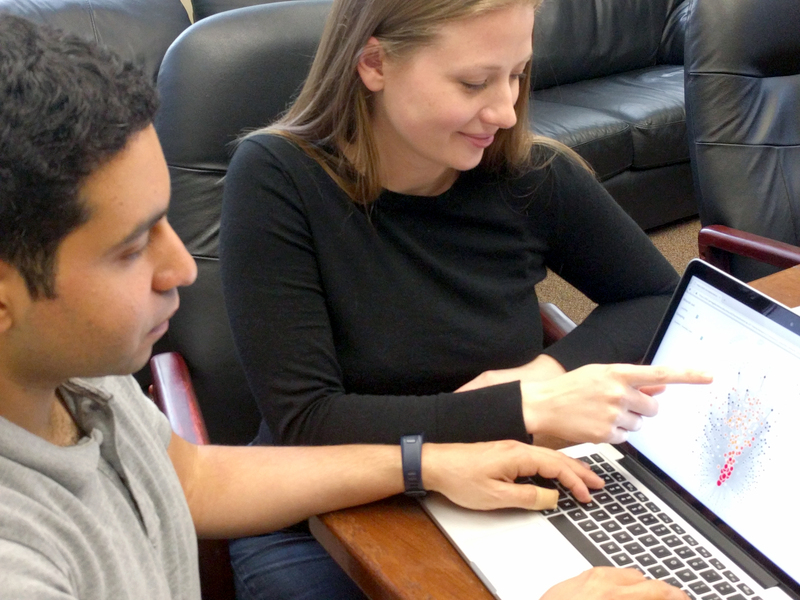 Led by Shaunna Morrison of the Deep Carbon Observatory and DCO Executive Director Robert Hazen (both at the Carnegie Institution for Science in Washington, D.C.), the paper’s 12 authors include DCO colleagues Peter Fox and Ahmed Eleish at the Keck Foundation sponsored Deep-Time Data Infrastructure Data Science Teams at Rensselaer Polytechnic Institute, Troy NY. Humans have collected a vast amount of information on Earth’s more than 5,200 known mineral species (each of which has a unique combination of chemical composition and atomic structure). Millions of mineral specimens from hundreds of thousands of localities around the world have been described and catalogued. Databases containing details of where each mineral was discovered, all of its known occurrences, and the ages of those deposits are large and growing by the week. Databases also record essential information on chemical compositions and a host of physical properties, including hardness, color, atomic structure, and more. Coupled with data on the surrounding geography, the geological setting, and coexisting minerals, Earth scientists now have access to “big data” resources ripe for analysis. Until recently, Earth scientists didn’t have the necessary modelling and visualization tools to capitalize on these giant stockpiles of information. 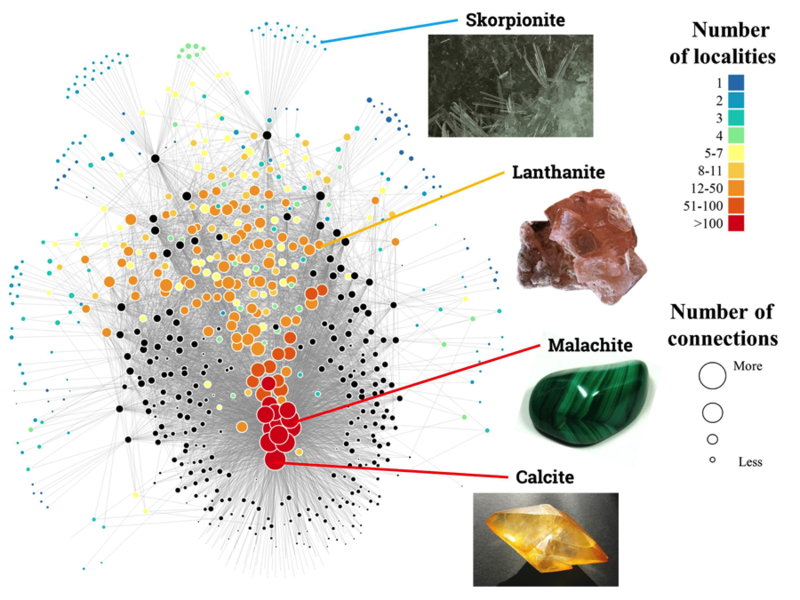 Network analysis offers new insight into minerals, just as complex data sets offer important understanding of social media connections, city traffic patterns, and metabolic pathways, to name a few examples. The network analysis technique enables Earth scientists to represent data from multiple variables on thousands of minerals sampled from hundreds of thousands of locations within a single graph. These visualizations can reveal patterns of occurrence and distribution that might otherwise be hidden within a spreadsheet. In other words, big data provides an intimate picture of which minerals coexist with each other, as well as what geological, physical, chemical, and (perhaps most surprising) biological characteristics are necessary for their appearance. From those insights it’s a relatively simple step to predict what minerals are missing from scientific lists, as well as where to go to find new deposits. Already the technique has been used to predict 145 missing carbon-bearing minerals and where to find them, leading to creation of the Deep Carbon Observatory’s Carbon Mineral Challenge (http://mineralchallenge.net/). Ten have been found so far. The estimate came from a statistical analysis of carbon-bearing minerals known today, then extrapolating how many scientists should be looking for. 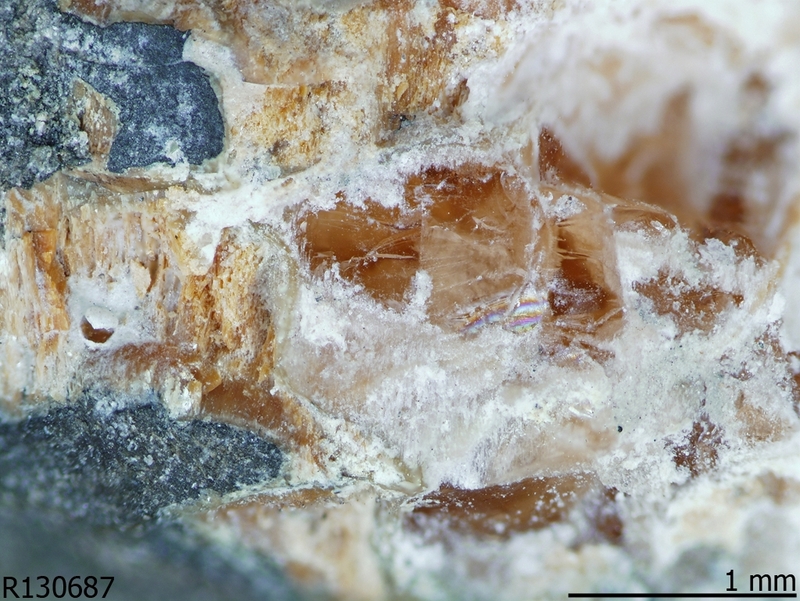 Abellaite and parisite-(La) (photos below) are examples of new-to-science carbon-bearing minerals predicted before they were found, thanks in part to big data analysis. “We have used the same kinds of techniques to predict that at least 1,500 minerals of all kinds are ‘missing,’ to predict what some of them are, and where to find them,” Dr. Hazen says. In a test case, the researchers explored minerals containing copper, which plays critical roles in modern society (e.g., pipes, wires), as well as essential roles in biological evolution. The element is extremely sensitive to oxygen, so the nature of copper in a mineral offers a clue to the level of oxygen in the atmosphere at the time the mineral formed. The investigators also performed an analysis of common minerals in igneous rocks—those formed from a hot molten state. The mineral networks of igneous rocks revealed through big data recreated “Bowen’s reaction series” (based on Norman L. Bowen’s painstaking lab experiments in the early 1900s), which shows how a sequence of characteristic minerals appears as the magma cools. The analysis showed the exact same sequence of minerals embedded in the mineral networks. 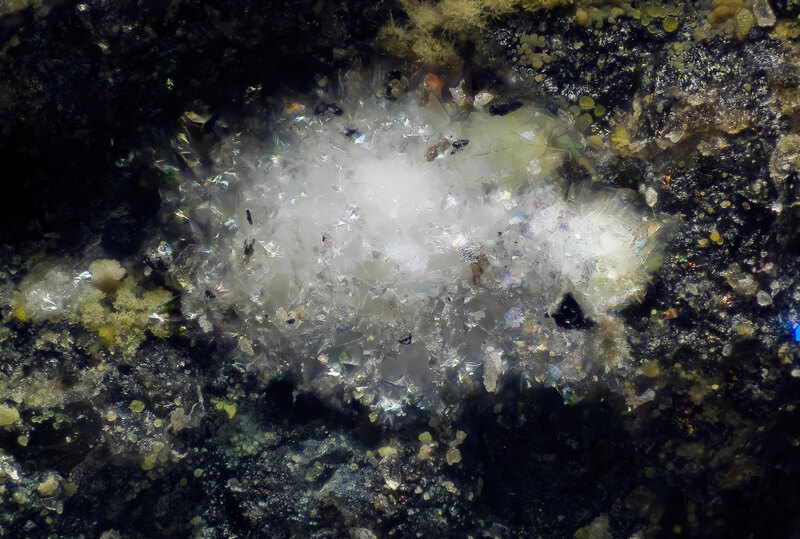 The researchers hope that these techniques will lead to an understanding and appreciation of previously unrecognized mineral relationships in varied mineral deposits. Mineral networks will also serve as effective visual tools for learning about mineralogy and petrology — the branches of science concerned with the origin, composition, structure, properties, and classification of rocks and minerals. Network analysis has numerous potential applications in geology, both for research and mineral exploration. Mining companies could use the technology to predict the locations of unknown mineral deposits based on existing data. Researchers could use these tools to explain how Earth’s minerals have changed over time and incorporate data from biomarker molecules to show how cells and minerals interact. And ore geologists hope to use mineral network analysis to lead to valuable new deposits. Dr. Morrison also hopes to use network analysis to reveal the geologic history of other planets. She is a member of the NASA Mars Curiosity Rover team identifying Martian minerals through X-ray diffraction data sent back to Earth. By applying these tools to analyze sedimentary environments on Earth, she believes scientists may also start answering similar questions about Mars. Click to view and download full-sized images. 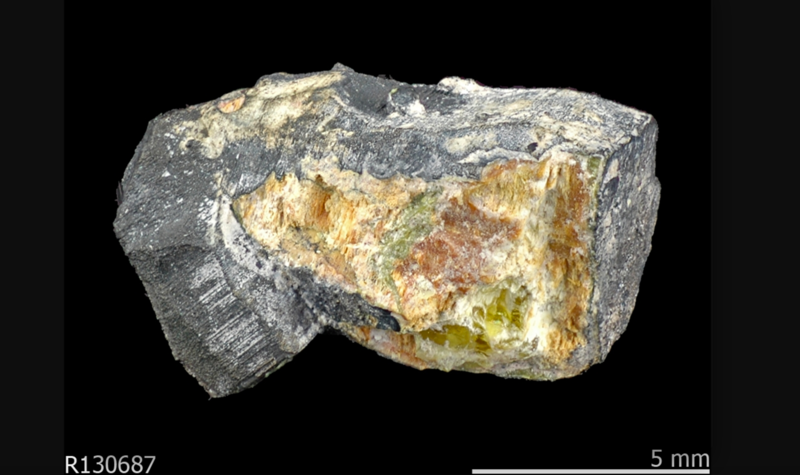 Parisite-(La) is one of the new carbon-bearing minerals that was predicted before it was found. Credit: rruff.info, donated by Dr. Luiz Menezes. Abellaite found in Eureka mine, Castell-estaó, La Torre de Cabdella (La Torre de Capdella), La Vall Fosca, El Pallars Jussà, Lleida (Lérida), Catalonia, Spain. A network diagram for 403 carbon minerals reveals previously hidden patterns in their diversity and distribution. Each colored circle represents a different carbon mineral. The size and color of the circles indicates how common or rare each mineral is on Earth. Four examples illustrated are: (1) calcite, the commonest carbon-bearing mineral, which occurs at tens of thousands of localities; (2) malachite, a beautiful green ornamental copper carbonate mineral that is known from thousands of localities; (3) lanthanite, a carbonate of rare earth elements reported from only 14 localities around the world; and (4) the exceedingly rare calcium-zinc carbonate mineral skorpionite, which is known from only one locality in Namibia. The black circles represent more than 300 different regional localities at which these minerals are found. The sizes of the circles indicate how many carbon-bearing minerals are found at each locality, and the lines link mineral species and their localities. The distribution of minerals and localities follows a distinctive pattern with a few very common minerals and many more rare species—a distribution that has led to the prediction that more than 1500 mineral species occur on Earth but have yet to be discovered and described. The hunt is now on for these “missing” minerals. A network of 664 copper minerals, sorted by composition. Each colored circle represents a different copper-bearing mineral. The color distribution, with blue, red, and orange circles clustered together, reveals previously unrecognized patterns of copper mineral distribution and may help to discover new copper minerals. Credit: Morrison et al., courtesy American Mineralogist. 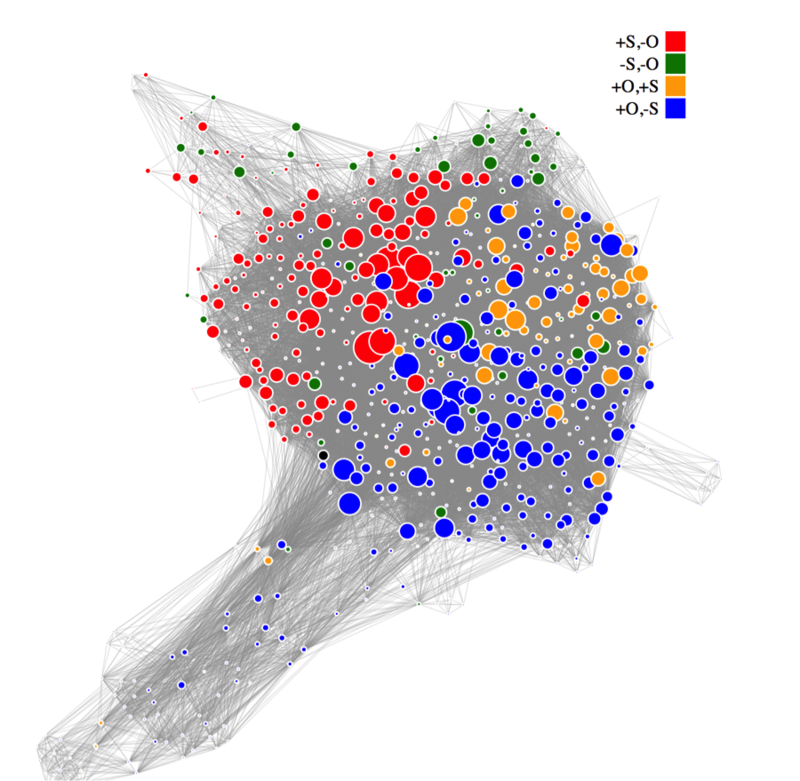 Researchers Ahmed Eleish (Rennselear Polytechnic Institute) and Shaunna Morrison (Carnegie Institution of Science) applied network analysis tools, comparable to those used in studying the spread of epidemics or in designing municipal power grids, to develop a brand new way of visualizing the connections of Earth's minerals.